If you are looking to commission work for your choir or simply discover new music I highly recommend you make contact with Sue Furlong. Sue is one of Ireland’s treasures when it comes to choral music composition. Not only is she an accomplished choral music composer and pianist Sue has led choirs she has worked with to national and international acclaim. I had the privilege of commissioning Sue to write for Aspiro’s 10th Anniversary. We approached Sue to set a text that was familiar to the choir – “Our Deepest Fear” by Marianne Williamson, which has also been attributed to Nelson Mandela who is said to have used it at part of his Presidential inauguration speech. (See SATB/SAB category). Not knowing how many Tenors and Basses we would have the following year in our Youth Ensemble Sue agreed to write it for SAB / three-part mixed. It was a collaborative commission where Sue visited some rehearsals during the learning process. It was great to have this support from Sue. 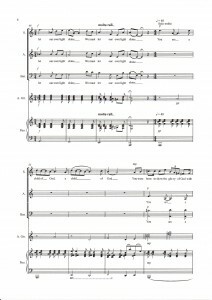 Sue also arranged “Our Deepest Fear” for SATB with optional instrumentation. Sue has a great understanding of voices of all ages. I have also had the opportunity to teach and conduct her ‘Peace Songs from County Wexford’ and ‘Beir Me O’ with the young members of Aspiro and RTÉ Cór na nÓg and I plan to do Sue’s ‘Lord Of The Dance’ in the near future. I have been using the songs from D’Aon Ghuth in my Irish lessons for the past 6 years. I have taught different classes from senior infants up to 2nd class and have also passed on songs to teachers of senior classes (right up to 6th). The children absolutely love the songs; they all have a lovely modern and funky beat with simple lyrics. I find it very easy to link them with the different strands of the Irish Curriculum. Chan cór na scoile An t-Asal Ádhúil agus Amhrán na n-Aoirí ag carúil na Nollag le cúpla bliain anuas. Baineann na páistí an taitneamh as na h-amhráin agus tá sé easca iad a mhúineadh toisc go bhfuil an ceol agus an dlúth dhiosca ar fáil don mhúinteoir. Ba dheas leis an lucht éisteacha ábhar nua aimseartha a chloisteáil. I mbliana chan Rang 3 agus Rang a 4 “An Draíodóir” agus “Bain triail as an cineáltas” ag ceolchoirm ag deireadh na bliana. Bhí pobal na scoile an tógtha leis an gceol draíochta. Go cinnte leanfaimid ag baint úsáid as D’Aon Guth mar áis scoile sa todhchaí.